LAST WEEK Deval Patrick shed the title he had worn for eight years. This week he donned the first of what will doubtless be a batch of new titles: The commonwealth's former governor announced plans to join the Massachusetts Institute of Technology as a "visiting innovation fellow" at the school's Innovation Initiative. As Patrick re-acclimates to life in the private sector, there will be plenty to keep him busy. He told Fortune magazine that he has been approached by venture firms, equity firms, and corporations. He will have his pick of speaking engagements and media appearances. And the political hive will keep buzzing with speculation about any future electoral plans. 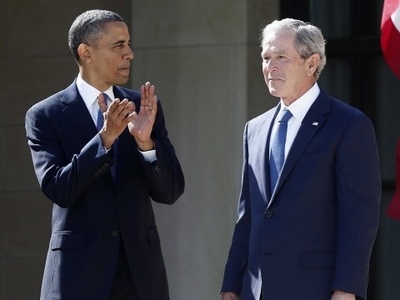 Former President George W. Bush has steadfastly refused to criticize Barack Obama's performance in office. Beyond all the to-do's on his list, however, Patrick should commit to at least one conspicuous not-to-do: The former governor will earn bipartisan respect and set an example of graciousness by preserving an honorable silence about his successor's performance. Like former presidents and former mayors, former governors are bound to disagree at times with decisions or statements made by those who follow them in office. That is particularly true when there has been a change of party — and when the new incumbent hasn't been shy about criticizing what his predecessor left behind. No one has set a better example in this regard than former President George W. Bush. Since leaving the White House, he has steadfastly refused to disparage Barack Obama, even though he must disagree sharply with much that Obama has said and done. "I don't think it's good for the country to have a former president undermine a current president," Bush has told interviewers. "I think it's bad for the presidency." He knows from experience that biting criticism from a predecessor — Jimmy Carter's negative comments come to mind — is not only unpleasant, but also invariably played up in the media. Former New York Mayor Michael Bloomberg likewise pledged not to speak out against his successor's handling of the job. "When you're a new mayor, you just don't need a previous mayor criticizing," Bloomberg said more than a year ago, as he prepared to transfer power to Bill de Blasio. Criticism aplenty has been aimed at de Blasio over the past 12 months — but none has come from Bloomberg. No matter what Charlie Baker does, one thing he can count on over the next four years is a regular chorus of dissent or disapproval. But that chorus need not include Patrick's voice — and it would be admirable of Patrick to promise that it won't.